The National Weather Service Will Blow You Away! 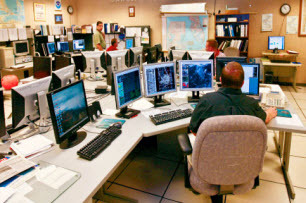 Make no mistake the National Weather Service Station employees are a busy bunch. Because of the location of the Florida Keys, sitting proudly between both the Gulf of Mexico and the Atlantic Ocean, the need to have a detailed weather report at your fingertips is of utmost importance, and this is where the national Weather Service come into play. They monitor the area of the Keys to the nearest second and are the first to report oncoming storms, low pressures, Florida Keys Hurricanes even quick starting waterspouts or more often than not the perfect conditions that make the Florida Keys a haven for sun worshippers the whole world over. A little known, (well at least we weren’t aware of this until writing this page), fact, is that over forty percent of the world’s shipping relies on the Florida Keys as an important stop. That is a multi-billion industry that is at the mercy of the weather, as it ploughs across the world’s oceans to deliver its valuable cargo. They need the most update technology working on their behalf, or as in the past they could easily be sailing directly into difficulties. Just the fact that there are so many shipwrecks around the area is testament to the fact that the waters are treacherous and have always been so. Even back in 1832, when the first Florida Keys rainfall measurements were recorded at the Sand Key lighthouse it was a commonly held belief that weather prediction would be of benefit to all, but it wasn’t until 1870 when the first proper observation station was opened on Duval Street. 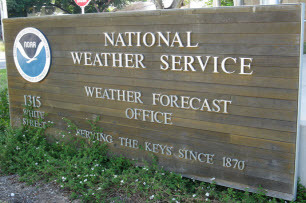 Over the coming years the service moved around a bit, until in 2006, it found its latest home, in the $5.100,000 customer built weather station on White Street, which at last brought the prediction of the Florida Keys weather into the 21st Century. If you fancy taking a tour of this interesting facility then it is free to visit, but you will need to make an appointment before hand, as it does have limited availability. The lobby in the station has quite a few screens all over the place that will show a few videos during the tour. By using a series of posters on easels they demonstrate how they collect the information about the weather, by attaching a radiosonde (which is an instrument that they take from a display case) to a weather balloon. The conference room, a place where visitors may sit and view several video and national weather service images. This part is only a part of the long, 60-minute tour. This room can only seat about 18 persons maximum. You will then go through both the shelter area, which has a sculpture created by Helen Harrison, a Florida Keys artist in it, and the operations area, where technicians and forecasters work on their forecasts and warnings.